The Royal Oak is Audemars Piguet's most famous watch. The collection's women's watches are smaller versions of the classic and feature diamond embellishments. Special editions, such as the Royal Oak Frosted Gold, are the ultimate fashion statement. The Audemars Piguet Royal Oak first launched in 1972 and quickly earned the nickname "Jumbo" for its relatively large size. Its legendary design is the brainchild of Swiss watch designer Gérald Genta. He is also responsible for some other classics, such as the Patek Philippe Nautilus and the IWC Ingenieur. Audemars Piguet teamed up with another watch designer, Jacqueline Dimier, to optimize the Royal Oak for a female audience. She reworked Genta's design, resulting in the Royal Oak Lady in 1976. The Royal Oak Lady remains true to the porthole design, including a distinct octagonal bezel that sits on top of a round case and is attached using hexagonal screws. The slots of the screws are aligned into a perfect circle, demonstrating just how much this La Brassus-based manufacturer values symmetry. This is also evident on the characteristic guilloché dial with a tapisserie-pattern made up of a series of small squares. It's this attention to detail that makes Audemars Piguet watches into masterpieces for the wrist. The Royal Oak Lady ranges from 26 to 41 mm in diameter and comes in stainless steel or rose, white, or yellow gold. Fans of retro timepieces should enjoy the bicolor editions in stainless steel and yellow gold or stainless steel and rose gold. The classic Royal Oak Lady is worn using an integrated metal bracelet, meaning the case and bracelet are one piece. There are also versions with alligator leather or rubber straps available. How much does a Royal Oak Lady cost? The original Royal Oak model had two hands that displayed the hours and minutes. A similar Royal Oak Lady from the 80s costs around 7,000 USD in very good condition. It features a 26-mm case in 18-karat yellow gold, a gray dial, and is powered by a precise quartz movement. This watch is geared toward those who want to change their watch often without having to worry about it stopping if they set it aside. You can purchase a more modern Royal Oak Lady with a 33-mm rose gold case and a chocolate dial starting around 32,600 USD. The brown dial perfectly complements the reddish shimmer of the case. What's more, this watch includes a date display at 3 o'clock. Prices for a Royal Oak Lady with an automatic movement begin around 9,300 USD. For example, at this price, you can get a 33-mm three-hand model in stainless steel with a white dial. Its practical date display at 3 o'clock and simple design make this luxury watch perfect for everyday life. 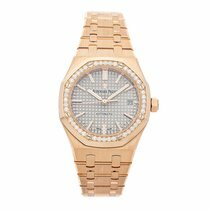 If you're looking for something a bit more glamorous, a Royal Oak Lady with diamonds may be just right for you. Most have diamonds on the bezel, the dial, or both. One example with both comes in a 26-mm yellow gold case and costs about 8,200 USD. Bicolor models in rose gold and stainless steel with diamonds on the bezel are particularly attractive and feminine. Here you will also find a date display at 3 o'clock on a silver-colored dial. 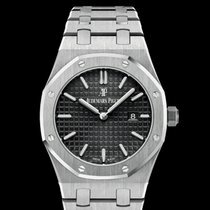 You can purchase this Royal Oak for around 19,200 USD. The trend toward larger watches has also had an effect on women's models. A new, 37-mm Royal Oak Lady with colorful sapphires demands over 46,500 USD. The orange of the precious stones matches well with the rose gold case and dial. Even the date display shines in this lovely hue. The in-house automatic caliber 3120 powers this watch and has a 60-hour power reserve. The Royal Oak Lady with a blue dial and 33-mm yellow gold case feels like a sunny day at the beach. However, you shouldn't go swimming with this model, as it is only water resistant to 50 m (5 bar, 164 ft). This quartz watch with a diamond-studded bezel starts around 35,000 USD. Audemars Piguet used the occasion of their 40th anniversary to pair up with yet another famous female designer, this time with jewelry designer Carolina Bucci. This partnership resulted in the Royal Oak Frosted Gold in 2017. The cases of these watches are finished using a Florentine hammering technique, which causes the timepiece to shimmer as soon as light touches it. The Royal Oak Frosted Gold is available in white or rose gold. At its launch, you had the choice between a 33 or 37-mm case. Since then, a 41-mm option has been added. You can also choose from a quartz movement or the automatic in-house movement 3120. Plan to spend about 40,800 USD on a 33-mm rose gold model with a quartz caliber. Prices for automatic pieces with 37-mm white gold cases sit around 58,200 USD.